This page is for the Steam version. 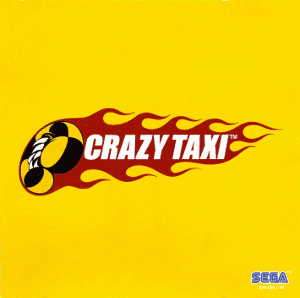 For other versions, see Crazy Taxi. Lacks the classic soundtrack by The Offspring and Bad Religion. 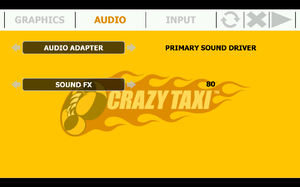 See Crazy Taxi Audio Overhaul to restore the original soundtrack. 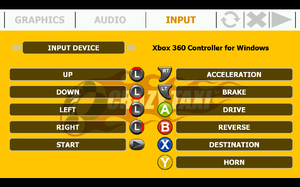 Lacks proper Analog control support- while you can use the stick, it's interpreted digitally. 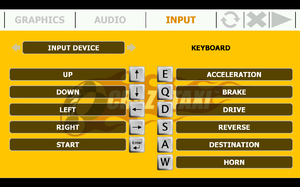 See Crazy Taxi Analog Controller Unofficial Fix to add analog control support. 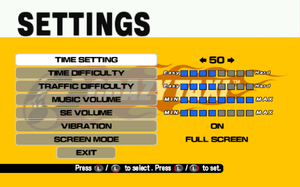 Sound effects and voice acting are too quiet and can't be turned up. Proper Analog Input for the Left Stick and triggers. High quality versions of the original soundtrack by The Offspring and Bad Religion. Higher quality versions of the included soundtrack in addition to the tracks above. 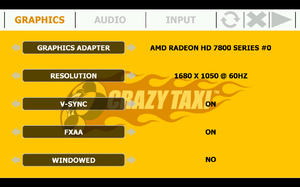 High refresh rates cut frame rate in half (e.g. 72 FPS on a 144Hz monitor). ↑ 2.0 2.1 File/folder structure within this directory reflects the path(s) listed for Windows and/or Steam game data (use Wine regedit to access Windows registry paths). Games with Steam Cloud support may store data in ~/.steam/steam/userdata/<user-id>/71230/ in addition to or instead of this directory. The app ID (71230) may differ in some cases. Treat backslashes as forward slashes. See the glossary page for details.